So quaint -- itinerant artist pedaling through the Irish countryside, paying for a night's lodging with a deftly done painting -- all so very analog. But it's digital that drives this clockwise, one-man, two-to-three month, slo-mo, 32-county, social media cycling and painting tour of Ireland. Irish artist Eolaí, a.k.a. Liam Daly, is chronicling his adventure in his many blogs, especially Paintingtour.com. He posts on his Facebook page as well, but it's his Twitter that propels this trek. While posting updates of his meanderings, the artist also uses Twitter to crowdsource his need for lodging among his #paintingtour hashtag followers, then pays his for his bed, and hopefully breakfast, with one of the two paintings he strives to create each day. "For the days when I have no planned host I'm likely to tweet from the bicycle asking if there is anyone within X miles who'd like to host in return for a painting," Eolaí wrote on his Paintingtour blog. "If that fails then I will paint a picture on the road, post a photo of it to TwitPic or PicPlz, and try to sell it to raise funds for a B&B... with the volume of stuff I'm carrying to paint, I decided it was too much to also carry a tent." He uploads a steady stream of photos to Twitter of the passing scenery -- a shady country lane, a goldfinch, the coastline, his bike after an accident, himself on the bike, his paintings. He even creates little podcasts on his ruggedized Motorola Zoom tablet while cycling, using a platform called Audioboo, linking them to his Twitter feed. Listen to him here in "on the Bike by Clew Bay." And for the bike geeks out there, he pedals a Cannondale T400 extended by what he says is "the greatest thing I've ever bought -- Xtracycle's Free Radical add-on." 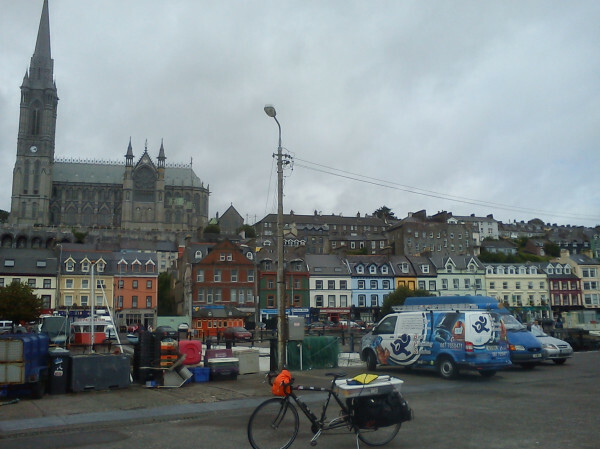 He left Dublin in early July, heading south, following a vaguely clockwise improvised route that will take him through, hopefully, all 32 counties, covering perhaps 35 to 50 miles a day for a total in the range of 2,100 to 3,000 miles. He now hopes to roll south back into Dublin by late September. If you see Eolaí pedaling along a Dublin bound-byway over the next few weeks, drive carefully! He stops frequently and unpredictably to capture -- by photo, tweet, blogpost, podcast and especially paint -- whatever catches his artistic eye. As I type he's pulled off the road to paint a panorama over Westport, County Mayo. Follow him on Twitter to see if he posts the results. Conor Harrington drills deep on the social media side of the story in an interview with Eolaí about his artistic bicycle odyssey in NewTechPost.com. Here's a tale of a writer who didn't cycle while he worked, but would go around in circles depending on the weather -- loved this look at George Bernard Shaw's rotating writing shed posted on the HonestArchitecture blog. The Irish American Writers and Artists will host another first-Tuesday-of-the-month Salon on Sept. 6 from 7 to 9 PM at the Thalia Café on W 95th Street, a few steps west of Broadway.